Every ethnic group and tribe in Botswana have their own distinct culture. This means that there are similarities, overlaps and dis-similarities between the individual Botswana tribal cultures. The similarities and overlaps in the cultures create a sense of a homogeneous national culture, but the existing dis-similarities remind us that the considered 'national culture' is a beautiful patch-work of different cultures. 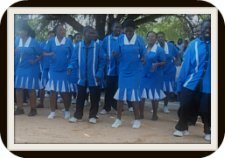 The dis-similarities in cultures that manifest in different cultural components must be acknowledged as true and creating diversity among the people of Botswana. These different components include art and crafts, myths and legends, ceremonies and celebrations, rituals and rites, beliefs and religion, and norms and values. It is acceptable to refer to it as Botswana culture, and the factors explained below set the tone to accept it as such. The degree of cultural integration in Botswana is well pronounced. There have been adoptions and exchanges of cultural practices between the ethnic groups and tribes over time, and an acceptable degree of homogeneity has been established. For instance, intermarriages occur between all ethnic groups even though each group may have its distinct rules. However, these rules are always understood to enable a smooth interaction, outcome and all are accepted by others. Language in Botswana has played and is still playing a significant role as national unifier. The national language is Setswana, and English is used in the office. 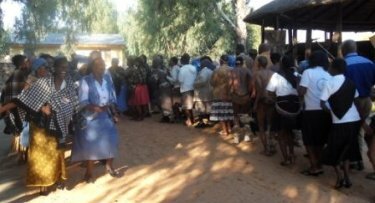 Just as well, with citizens being identified as Batswana, Setswana is generaly used and preferred for communication. 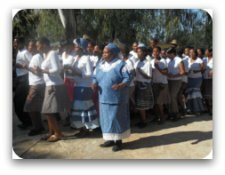 Originally, Setswana is a language for the Tswana ethnic group - out of which there are several dialects of Setswana spoken by various Tswana tribes. Other ethnic groups such as Bakalanga, Basarwa, Babirwa, Basubiya and Hambukushu have their respective languages but not similar to Setswana. 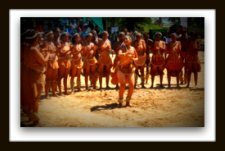 However, all ethnic groups have embraced Setswana as the national language. The national language has no received pronunciation to restrict citizens to use an agreed set of words and fixed pronunciation; but there is a generally accepted and known lexicon that makes up Setswana language. Batswana intrinsically understand the importance of being united. This factor has greatly contributed to the pervasive existence of democracy and peace in the country. Democracy and peace have rubbed off onto the cultures thereby creating a feeling of a homogeneous national culture amongst the people. 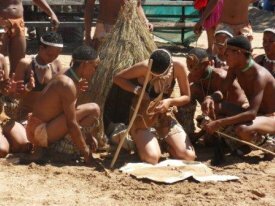 Rituals and rites for some groups along with the related norms and values have been adopted by other groups, and vice-versa. The collective belief system has been greatly influenced by the dominant religions such as Christianity that cut across all ethnic groups. Generally, such influences have set the tone where recognition for the nation takes precedence over that of the individual tribe. So, what is Botswana culture? Botswana culture is essentially what the country is known for today; peaceful, democratic, racial harmony, stable, humble and welcoming people and independent. 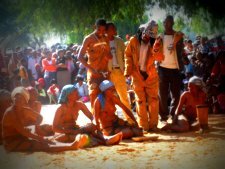 While this represents the political culture, it has tended to seamlessly blend well with the social culture borrowed from all ethnic cultures to create a Botswana culture. Botswana culture is at the centre of everything going well in Botswana. Admittedly, in urban areas the western culture has affected the local culture, which factor has also slowly spread to some rural areas where traces of the modern lifestyle is noticeable. 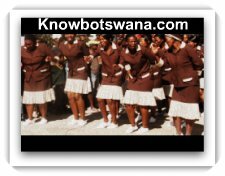 The culture of Botswana is prominent in the Setswana language, traditional music, local food, dance, traditional attire, rituals and other ceremonies like wedding celebrations. 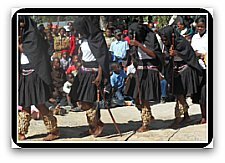 Botswana culture is celebrated every year in a commemorative festival called 'Letsatsi la Ngwao' - Botswana Culture Day. 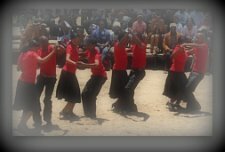 The President's Day cultural exhibitions and competitions are another commemorative way of promoting culture in Botswana which are conducted annually. This involves the exhibition of cultural artifacts and crafts on a competition basis, starting in regions then winners proceeding to the national finals culminating with an award of prizes by the nation's President. The preservation of Botswana culture has been institutionalized through the establishment of the national museum and national archives bodies. The national museum and art gallery in Gaborone collects and displays locally produced traditional crafts and paintings. It also has a botanical garden to preserve plants and trees that are indigenous to Botswana. The national museum and art gallery also commemorates culture annually through basket exhibitions as a way of preserving culture. The best baskets in the country go on within the museum with the public invited to view the exquisite products. There are museums in other cities of the country. These display cultural products that are reflective of the dominant culture in which the museum is located. The national archive is the custodian of the corporate memory for Botswana government. Much of historical information for the country is preserved for posterity and research. Batswana are communal as recognition of the family, tribe and nation overshadows that of the individual. The father is considered head of the family to be revered by his wife and children at all times. But it should be admitted that presently in Botswana the individual seems to take precedence over the group, a characteristic associated with the western cultures.